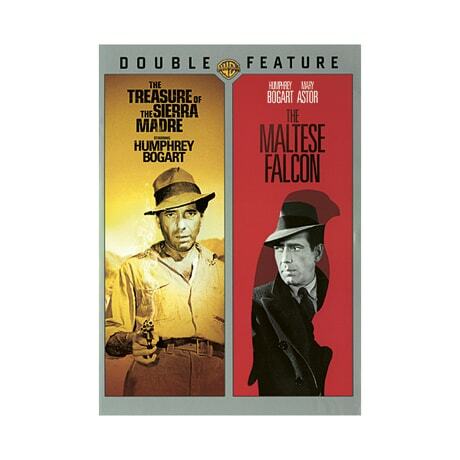 (Academy Award Winners Included) The most iconic actor of Hollywood's Golden Age, Humphrey Bogart is seen in two of his defining films in this double feature, both directed by John Huston. As ruthless prospector Fred C. Dobbs, Bogart showed his knack for portraying villains in The Treasure of the Sierra Madre (1948), an Academy Award winner for Best Picture, Director, and Supporting Actor, for Walter Huston's memorable turn as a gold digger looking for something more profound than wealth. In The Maltese Falcon, Bogie establishes the archetype of the hard-boiled private eye with his performance as Sam Spade, a tough-talking investigator trying to find out why people are willing to kill each other for a statue. This 1941 film earned Oscar nominations for Best Picture, Screenplay, and Supporting Actor, for Sydney Greenstreet. DVD extras include commentary on each film by Bogart biographer Eric Lax, plus newsreels and three classic Warner Brothers cartoons.